Casket bearers were Alvin Damlow, Gary Damlow, Brian Damlow, Dave Wittman, Roger Kaufmann and John Heil. Interment was in Fort Snelling National Cemetery in Minneapolis. 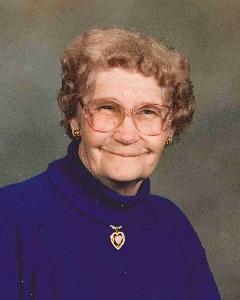 Loretta Mary (Witthus) Templin was born Aug. 29, 1922, to Art and Lydia (VonBerge) Witthus. She was baptized as an infant Sept. 22, 1922, and was confirmed in her faith as a youth on March 21, 1932, both at St. John’s Lutheran Church in Norwood Young America. She grew up in Glencoe and received her education at a country school until the eighth grade. She was united in marriage to Herman J. Templin on June 29, 1942, in Lubbock, Texas. They made their home in Norwood Young America, and their marriage was blessed with four children — Diane, Glenn, Shirley and Richard. The couple shared over 44 years of marriage before Mr. Templin’s death on Jan. 21, 1987. Mrs. Templin worked at Green Giant, Tonka Toys and, for many years, at Hillcrest. She was a member of St. John’s Lutheran Church in Norwood Young America. She always had a smile on her face for everyone she met. She enjoyed flowers, watching cartoons, crossword puzzles and going on walks, when she was able. She also enjoyed spending time with her family and friends, especially her grandchildren. She is survived by her children, Diane Damlow of Hutchinson, Glenn (Diane) Templin of Lester Prairie, Shirley Berry of Hutchinson and Richard (Wendy) Templin of Glencoe; 10 grandchildren; many great-grandchildren and great-great-grandchildren; sister, Eldora Damlow of Norwood; sister-in-law, Clara Witthus of Glencoe; and nieces, nephews, other relatives and friends. She was preceded in death by her husband, Herman Templin; parents, Art and Lydia Witthus; sisters and brothers-in-law, Elva and Chuck Kraemer and Delores and Willmer Unglaub; and brother, Elroy Witthus.